Cody Stephens, 2017RenegadeSport4x4, flamezrule2000 and 9 others like this. If there hasn't been any progress made on this! People feel free to send me your Tire/Wheel setups and I can compile a list and post it. I have frequent free time . I have a 2015 Jeep Renegade Trailhawk and just installed the BFGoodrich AT KO2 in 225/65R17. It runs great and I have zero rubbing or clearance issues. 2017RenegadeSport4x4, Corelokt, Jimmy Lee Smith and 1 other person like this. Are those available with the raised white letter? Or did you have mounted in intentionally or......? I just put Hankook Dynapro AT-M 235/70/R16 tires on my completely stock 2016 Jeep Renegade Latitude 1.4L manual. No spacers, lift kit, or other modifications. No rubbing or other issues at all. Gabrielle and ppholton like this. That's a good looking tire! Thanks, just got 225-70-16 Geolander G015. Pics of the Geolander G015 in 225/70/16. So far they ride great on the highway are as quiet as the ContiCrap OEM tires at any speed. Will have to see if my MPG suffers. 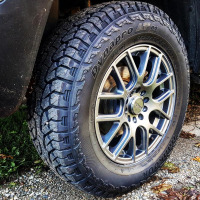 I think these tires are a great for me as they are a combo highway/all terrain tire. I commute 60 mile round trip & play in the dirt on weekends. Will update on how they perform off road & if we get any more snow or ice this winter. Doesn't look like as it will be in the 70's & 80's next week but you never know with Colorado weather. AZRenny, manucrystal, Jimmy Lee Smith and 1 other person like this. I've always had great service from Yokohamas... how's the road noise? got rid of them afyer a week. they track really bad on grooved concrete highways. The tread blocks are just narrow enough to fit in the grooves. went with Big O brand Big Foot A/T in the same size. I did the same I do have 2" spacers no problem with any rubbing noise level is minimal. JoshMo87 and Jimmy Lee Smith like this.